Hunter 53202 Kingsbury Ceiling Fan with Blades - 52"
Home > Home Improvement > Fans > All Ceiling Fans > Hunter 53202 Kingsbury Ceiling Fan with Blades - 52"
Intricate details give the Kingsbury Ceiling Fan from the Hunter Fan Company a refined appeal that you're sure to enjoy. Crafted from high quality materials with a focus on high style design, the Kingsbury 52 inch Ceiling Fan includes five fan blades with a reversible walnut and cherry finish that permits you to customize the look and feel of your new Hunter ceiling fan. The Roman Bronze finish is dazzling to look at, while the Whisper Wind Motor powers the fan quietly and efficiently in your choice of high, medium, and low fan speeds. 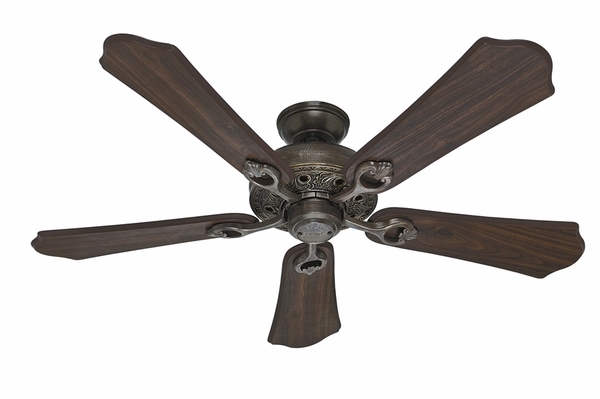 The Kingsbury Ceiling Fan is both beautiful and affordable, a true mark of excellence.